“Be brave, be brave, be brave…” she whispered to herself as she put on her helmet. Lucy was (and still is) learning to ride her bike. She said the little mantra over and over and added a “You can do this” as she climbed on the seat. I didn’t really know that bravery was calling me this year, until it did. Every situation around me was asking me to step into, or hunt it down or take one step closer. Whatever it is, I know we are not meant to be brave alone, even though we face our worlds on our own. I remember years ago when I was very, very pregnant and our family was going through a very hard time. Depression had fallen over our house (for Jorge) and in the way where everything sort of fell apart , everything I knew over the years was looming suddenly became so clear. While we were finding our way through, my dear friend Heather offered to give me a massage therapy session. During the session, at a point of finally being relaxed after holding so much, I closed my eyes and this very clear picture came into my mind like a giant movie screen. I was walking up a huge hill, each step taking all my energy, at one weary moment I turned around, and a massive group of people were behind me, rows and rows, as far as the eye could see… holding hands, locked together like an army. It was a walk of bravery ahead, but even in all the darkness, the kindness was behind me. 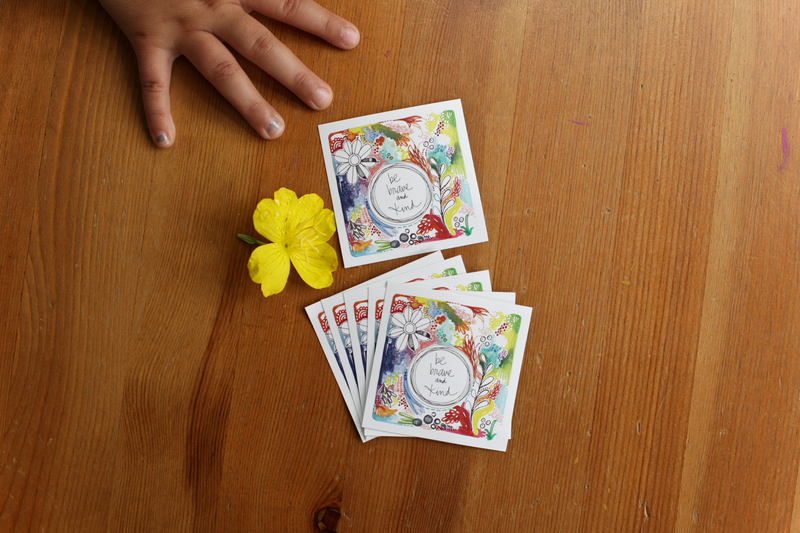 So when Suzanne and I started to dream of what we wanted our soulsisterhood to be, we both knew Be Brave and Kind would be part of what we wanted in the world (I wrote about it here first). …and yet it feels more like part of our dream is that this art would bring people together like the rows, like hands locked together. Just yesterday, I reached out to a few people I love, people that have walked the hill and people that have stood behind me, people that know what it is to be brave and kind, people that are claiming it everyday whether we succeed or not… I asked them to be part of this project by collecting each face in a picture. 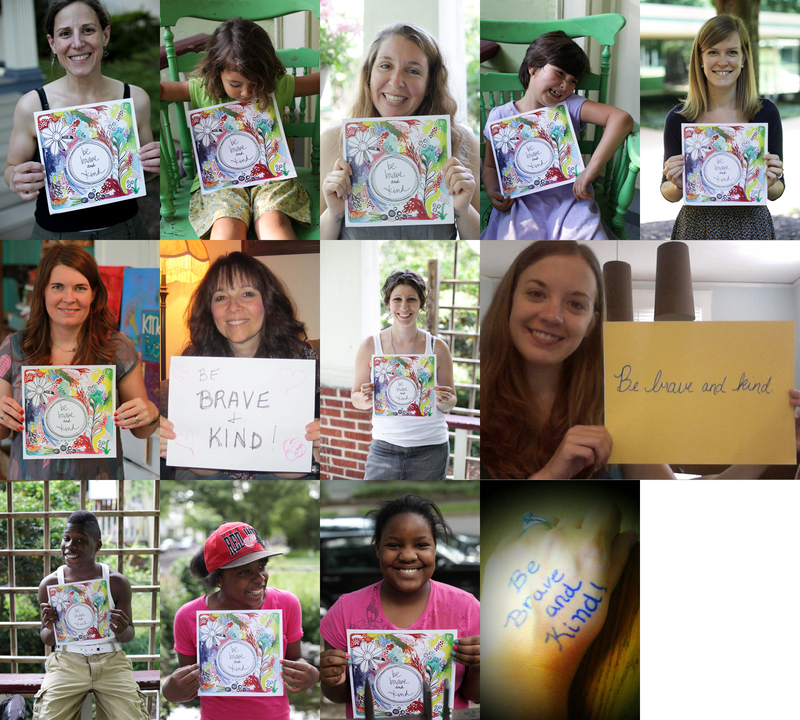 Suzanne and I would love it if you would join us in making rows and rows of pictures…we would love it of you took a picture with the Be Brave and Kind print and send it to patience@kindessgirl.com so we can add it to the next row and watch it grow. There are quite a few choices of prints and stickers you can buy here. Prints and stickers of all sizes. But even if the print is not something for you right now but you would like to be part of this collective heart and art, send us a picture with the words Be Brave and Kind written on a piece of paper or your hand, or any other creative way you can think of. We would love for you to be part of this either way. today’s hint: there is one sweet little sticker in the top copy of The Tale of Despereaux by Kate DiCamillo at the Broad Street Barnes & Noble on Libbie Ave. on page 243. 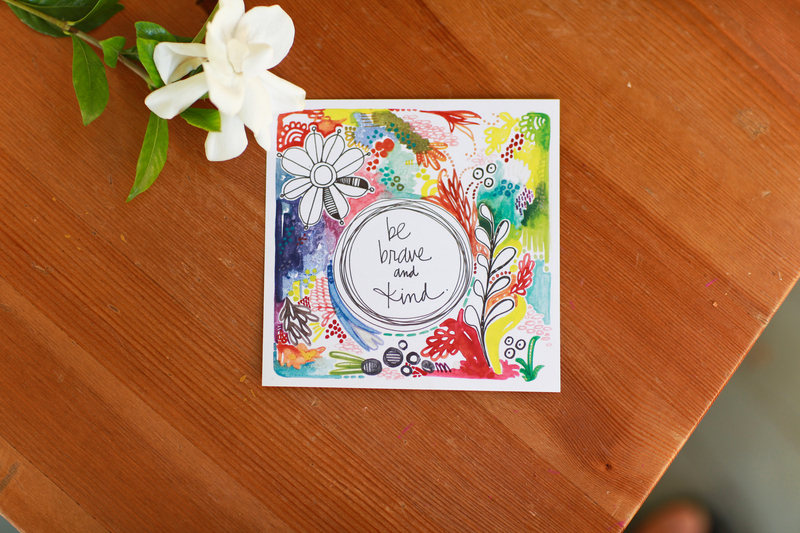 And today we offer one 5×5 Be Brave and Kind Print to one lucky winner, just tell us one high and one low in your day today in the comments and you will be entered. We will announce the winner tomorrow night by 11pm. Highs and Lows… Such a norm for me. My HIGH today was when my little sister emailed me and she nailed the ACT and she is officially on her way to getting her RN degree at the age of 38 and three kids to boot. My low… my youngest, in the army, far from me, is getting divorce after only 2 years of marriage. I love this post – Patience, you are really hitting it on target for me right now. My high… two – my son’s first day of summer vacation, and noticing that my moonflower seedlings are sprouting through the ground by my deck and how much I look forward to these lovely blooms in a few months, glowing in the moonlight with their night time fragrance. My low…my oldest cat is not doing well and the struggle as to what is best for her at this point. Hoping I don’t have to make the choice. My High & Low are one and the same – a blog post I’m about to hit ‘publish’ on. My Low – letting someone else’s need to be competitive at my expense get to me, and damage someone else’s feelings to boot. My High – being able to recognize that for what it is, recognize that I have wonderful people around me who support my goals, and not letting myself go voiceless against the negativity. Speaking my truth is the best High in the world. I always love your posts – they always brighten my day and make me think, like really reflect – which is always lands me in a better place than when I started. My high for today was this morning. There were a few things in a row that just made me giggle. My low would be not accomplishing all that I wanted to, but I did accomplish a few things and by the inch it’s a cinch, but by the yard it’s hard, so we’re on our way! My high was seeing my awesome daughter-in-love, Paula in picture number one holding “Be Brave and Kind”. She is a wonderful wife to my son Gregory and an amazing mother to my precious grandson Nicholas. Continued…from my brother-in-laws funeral. He was a brave and kind man. He will be missed. Pray for our family. It’s been a rough week, but being brave and kind helped me out immensely. In order of low to high today: I felt extremely worried and nearly frozen about going to my job this morning (it’s a very complex toxic situation). But as I was walking towards the subway I spotted a cluster of beautiful purple wildflowers growing near our local park. I snapped a photo of them with my phone and sent them to my dear husband with the words: “I picked some flowers for you!” My heart opened with the realization that I am able to give and receive love. So the fear released and I felt a jolt of courage to keep going. Patience I just love your imagery of everyone arm in arm, holding bravery in one hand and kindness in the other. What a truly gorgeous spirit you have! Where to start, where to start. I thought I might be able to capture a few spare minutes at the office today and brought a couple of cards and my awesome “kindness” stickers with me. Great intentions, right? Yet somehow I managed to spiral to frustrated. I lashed out at a co-worker and felt justified in doing so; went to the bathroom to cry and be disgusted with myself as it served no KIND purpose. I thought of sending this coworker one of my cards with a sticker and knew it was a shallow attempt to undo a harm that I had caused. I am anxious for tomorrow to apologize and at this point I am seeking a glimmer of a ” high point” of this day. Thanks for providing a place to share, to fail, to ne lifted up and to know I am not alone. Peace and love and kindness…I hope to be brave and humble tomorrow. My high for today… my 5 year old son (who has verbal apraxia, which makes conversations difficult) called my father to wish him a happy birthday. For the very first time, my son had a descriptive conversation with my Dad on the phone! It was beautiful to hear the pride (and confidence) in his voice and to see the smile of joy on my son’s precious face. Seeing him be brave and take a risk is pure beauty. My low for today? Waking up to hear my kitty puking by my bed at 5am. Ick. High was spending the day with my Sister and my little man who doesn’t start kindergarten until next September so I still have these last few months before he is “school-aged”. Low was fighting with my Husband when he came home from work. High- watching ate sunrise ovr the river before leaving my parents house. my high today so far: my oldest son, about to be thirteen, wearing my blue fuzzy robe this morning because it was chilly, and he kept smiling at me, knowing he looked silly, and saying, “this robe is awesome!” 🙂 My low was my 9 year old daughter berrating me for not putting her bagel in the toaster yet….kids usually make their own breakfast and she was whiny so I said I would but I hadn’t yet. I unleashed a torrent on her about finding fault and THEN (not great parenting moment) started listing things I have asked her to do that she hasn’t yet. High: sweet rainfall after a dry season. (but be brave and kind:). High: Passing a 3 hour test required to keep my job of 5 years. The test had been looming over me like a dark cloud for the past 6 months. The best part, I didn’t just pass it, I got a 91%! Low: My aunt who’s had so very much trauma in her life lately, a brain tumor, a massive brain bleed, a letter from the IRS saying she owes 16K, and now they think they’ve found a new breast cancer tumor (she’d been free of it for 5 years). Scary times. My low was finding out that I need six months of anticoagulation for a blood clot in my leg that came out of no where…being brave, despite all of the scary things it could be caused by. My high today is my precious baby boy, sleeping soundly in my arms, listening to him breathe, feeling his warmth, thanking God he blessed us with our miracle. May God wrap you in his arms, just like you are doing with your son and may you feel just as safe! Thank you so much. That actually made me cry. I got lost in thinking of my own high & low for my comment yesterday and remembered that I wanted to tell you something. Your beautiful daughter being able to encourage HERSELF – to talk herself through something that scared her – at her young age is amazing. You haven’t just given this girl thoughtfulness and courage as a gift to who she is, so that it comes from her, but you’ve given it to her as lovely armor to conquer the world. Good work mama! Congratulations! You definitely got this one right. Be brave and be kind. Thanks for being so honest and brave to share so much of yourself. You will never know how much you are helping. High – spent the day with my daughter & talked about lots of stuff related to her going away to college in the Fall. Low – did more talking than listening. So exited to have won this print!!! Can’t wait to send you my picture with it!